Snowdrops signal the start of spring, and the National Trust's Anglesey Abbey has one of the finest collections in the country, boasting over 240 varieties of snowdrop in amongst its glorious gardens â a perfect location for any keen walker. 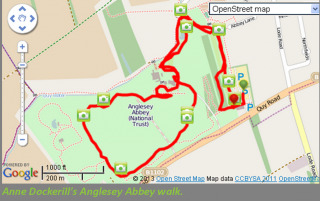 For those who have an opportunity to visit Anglesey Abbey we recommend Anne Dockerill's Anglesey Abbey walk. Anne's route is a short 3 mile walk that takes in the scenery of the National Trust's gardens. The abbey's Snowdrop Festival runs from 28th January - 3rd March and visitors are invited to join the Snowdrop Tour on weekday afternoons from 14:00. At the start of February around 50 per cent of the snowdrop collection was in full flower, providing a beautiful spectacle at the abbey. One of the landmarks on Anneâs walk is the Lode Mill built over 1000 years ago and even mentioned in the Doomsday Book. Now an 18th Century water mill stands in its place, fully restored and still functioning today, selling flour to visitors. The abbey itself dates back to the 12th Century and was left to the National Trust in 1966 to represent the 18th century way of living. 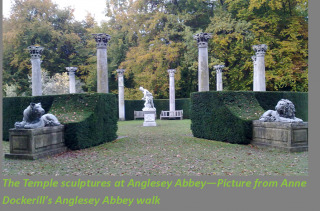 Also featuring on Anneâs walk are the beautiful sculptures and urns dotted all over the gardens, making this Jacobean-style house and gardens a true treasure trove of sights, and a real must see! The scenery at Anglesey Abbey is one of our favourites at this time of year, but if you have any other suggestions please let us know! If you do visit the abbey this spring, please take a picture of the beautiful snowdrops and post it on our Facebook page, or tweet it to us - we would love to see it! 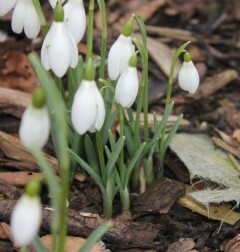 If you would like more information about the Snowdrop Festival click here.